A new home offers infinite potential as the setting where your family’s day-to-day life will unfold, and special memories will be made. Morning coffee, birthday parties, and family dinners can all be enjoyed both indoors and out. One challenge of newly built homes is that they may offer only a small simple deck or patio, as builders typically focus more attention on the interior of a home than its outdoor living space. This gives homeowners an excellent opportunity to build an outdoor living space customized to their unique interests. Take a look at this spacious, beautiful home in Apex, NC. The builder included a standard screened porch, but the homeowners wanted additional space for grilling, dining out, and spending time with family. 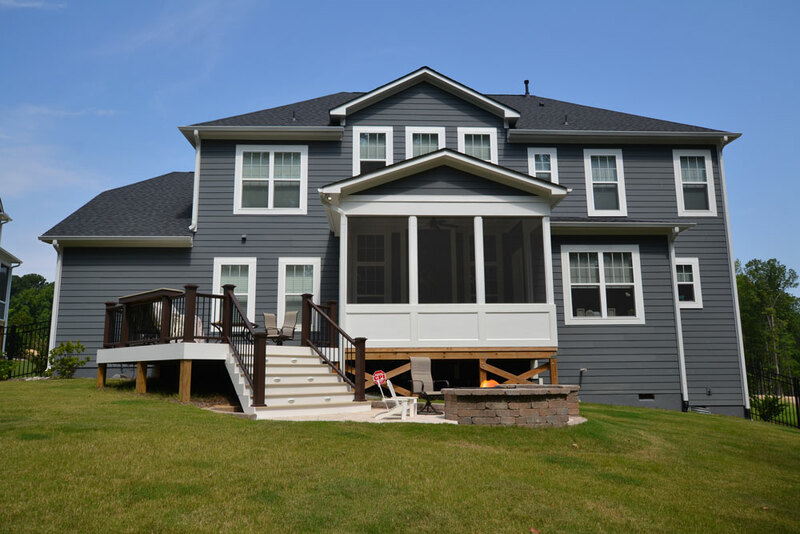 To meet their needs, we added a custom-designed AZEK composite deck plus a paver patio with a fire pit and two seat walls for lasting enjoyment. This family’s new AZEK composite deck, in a light-colored Hazelwood shade, features a unique parting board inlay and picture frame boards in a darker color, Kona, for visual interest. For a place to pull up a stool and linger on the deck, we added a bar-top rail on the deck in matching composite materials. Leading from the deck down to the patio are flared steps that can be used for additional seating, with riser lights for safety. The deck’s dark brown railing system matches the Kona deck board accents. The patio features Dublin three-piece Cobble pavers by Belgard in Kiawah, with a contrasting soldier row in Potomac. The fire pit and seat walls are made of Belgard’s Weston Stone in the Colonial shade. In the existing screened porch, we installed a Larson screen door with a dog door, so that the family’s pet could move among the new outdoor living spaces with ease. The screened porch and new additions blend together seamlessly for a cohesive and beautiful look. Enjoy the gallery below to appreciate the rich details of this fully customized Apex, NC, combination outdoor living space.